This past weekend I decided to escape the hustle and bustle of the city and go to the beach. My wanderlust was calling for something new yet quiet. I decided to visit the tiny island of Ammouliani. 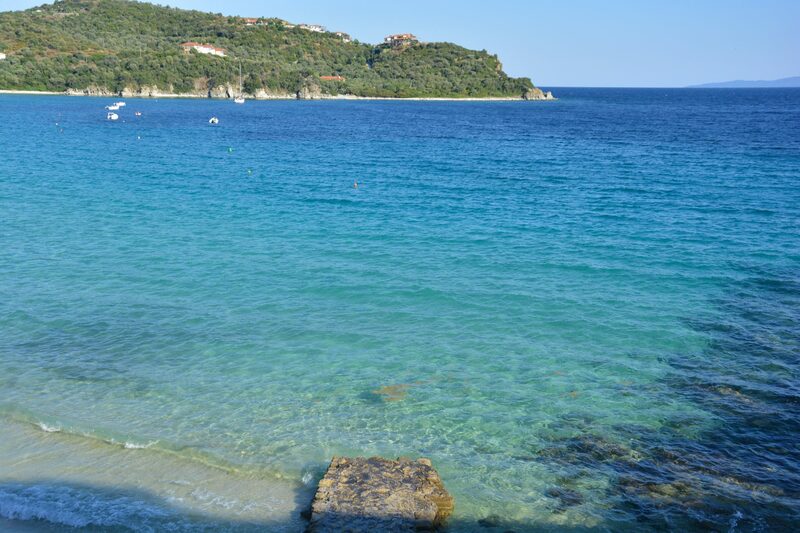 Ammouliani is an island off of the gulf of Athos peninsula (the third peninsula of Halkidiki). 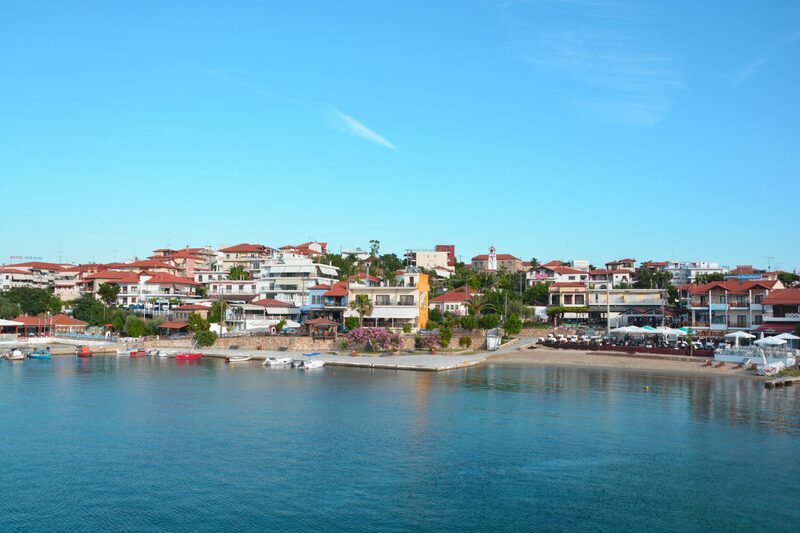 It is the only island of Halkidiki that’s inhabited. 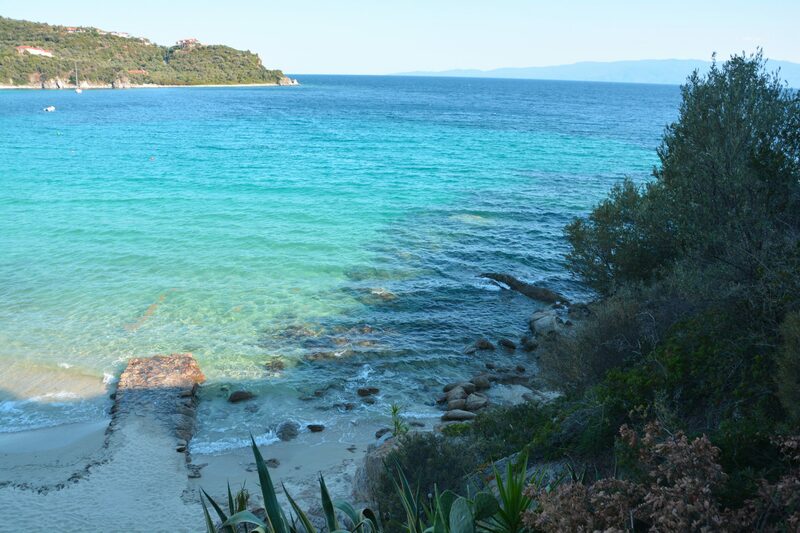 I call Ammouliani, Halkidiki’s best kept secret, because few foreigners know about this charming little island. 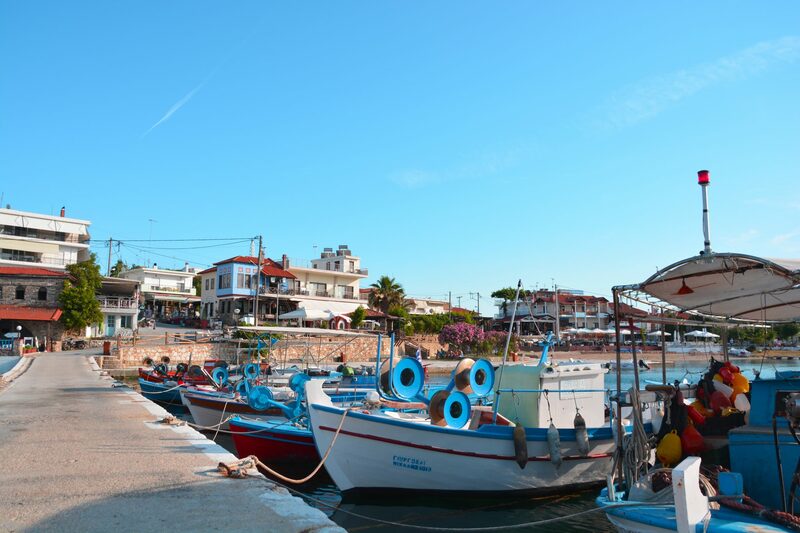 Even Greeks tend to visit larger, more popular islands. However do not let this tiny little island fool you. The crystal blue waters on this island are some of the best I’ve ever seen. Since the island is not packed with tourists, you can actually enjoy the islands’ beauty. Most of the taverns and shops are situated around the port, however many cafes and taverns can also be found across the island. Unlike the Cyclades or other islands found in Greece, Ammouliani is covered in green and olive trees. With a size of 4.5 square kilometers, Ammouliani is ideal for anyone looking for a short but worthwhile vacation. 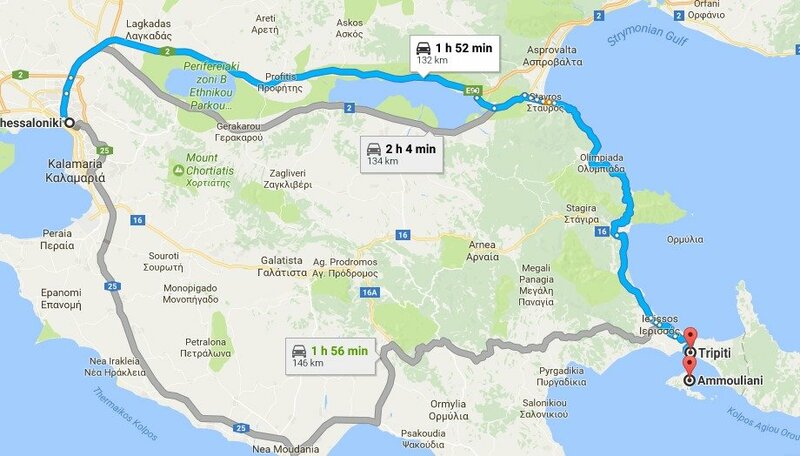 The only way to reach the island of Ammouliani is by taking the ferry from the port of Tripiti, Halkidiki (about 2 hour drive from Thessaloniki). The ferry timetable can be found here. The price per passenger is 2.10€ and for a normal passenger car it is 10.10€. There is a ferry ride to the island every hour. The ride to the island is about 15 minutes long. 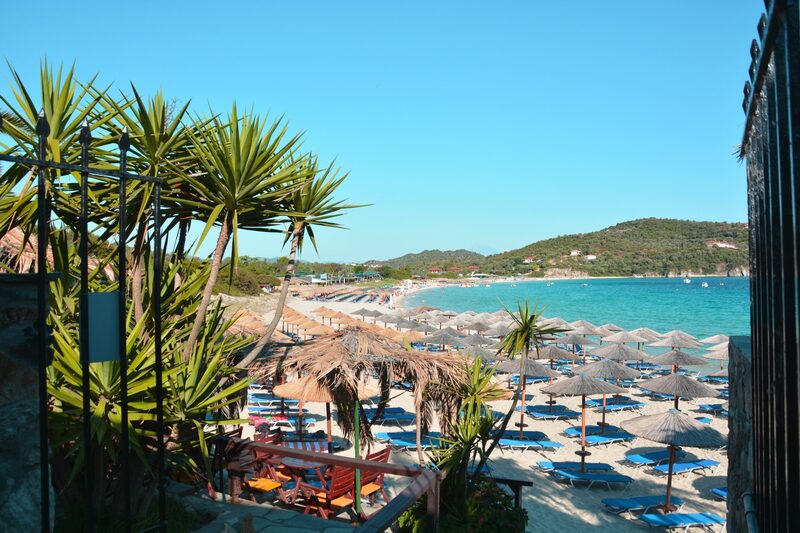 There are several beaches in Ammouliani, which include, Alikes, Megali Ammos, Agios Georgios, Karagatsi, Faka, Tsaska and Nissaki. Although all of them have soft golden sand and crystal clear blue waters, Alikes is my favorite. 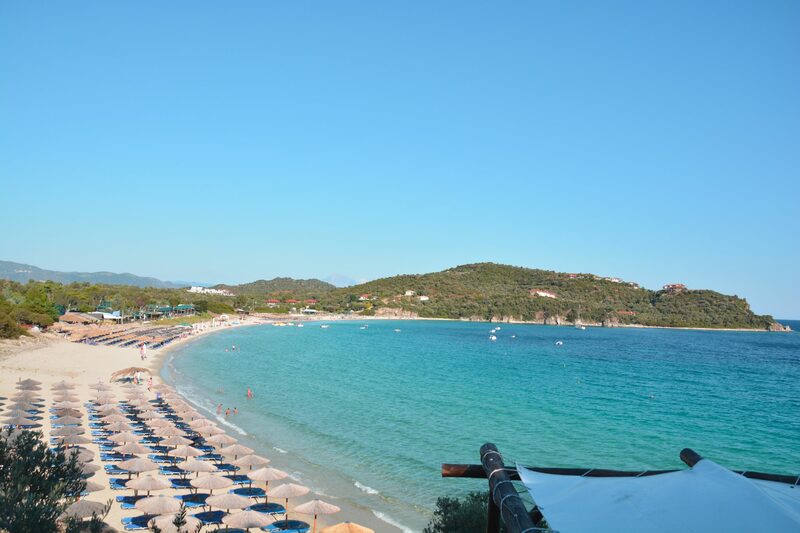 With a crescent shaped beach, Alikes includes one camping site, three beach bars to choose from and one tavern to eat at. • There is a public bus that can take you to the beaches. However, it only runs once an hour. • You can rent cars, motorcycles or bikes to tour the island. • The last ferry from Ammouliani to Tripiti leaves 7 PM (until July 2nd) and 7:45 PM (July 3rd-September 10th) so make sure not to miss it or else you’re going to be stuck on the island! • There is one big hotel complex, the rest are family owned hotels, studios or rooms to rent; there are also two camping sites. Ammouliani offers everything a tourist might need, from supermarkets to souvenir shops, to taverns, to fast food and cafes, and to beach bars. This is the perfect island for anyone who needs a quick getaway from the city or for whoever wants a quiet and relaxing vacation. Although my stay at this beautiful island was short lived I will definitely be back soon. Planning on visiting Ammouliani? Let me know what you think about this little blue island! You can read more about my travels here! Help spread the word by pinning this!